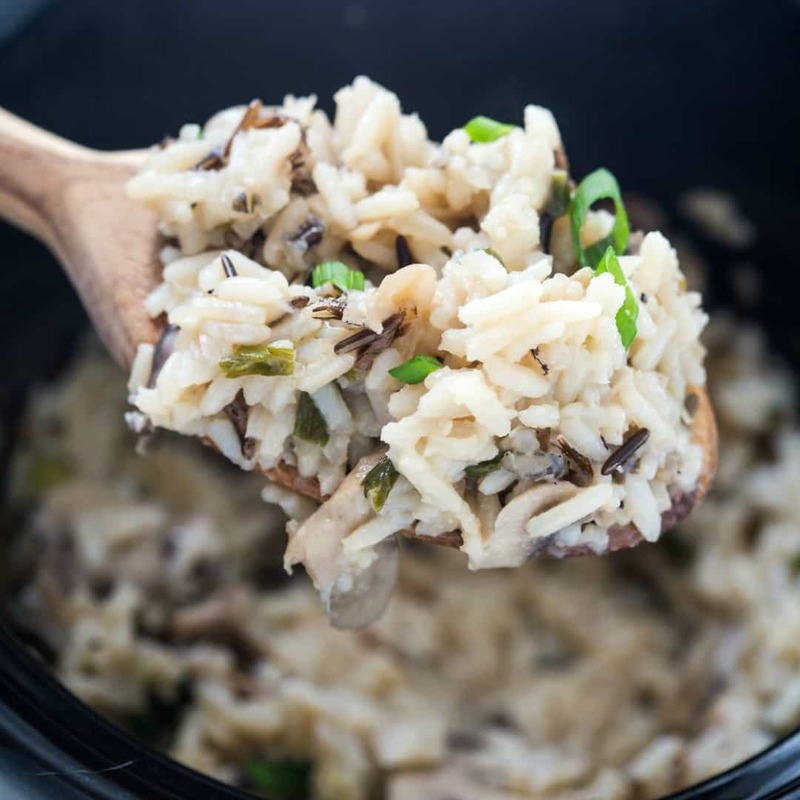 I cannot get over how easy this Slow Cooker Mushroom & Wild Rice Pilaf is! It’s perfect for potlucks and holiday gatherings! 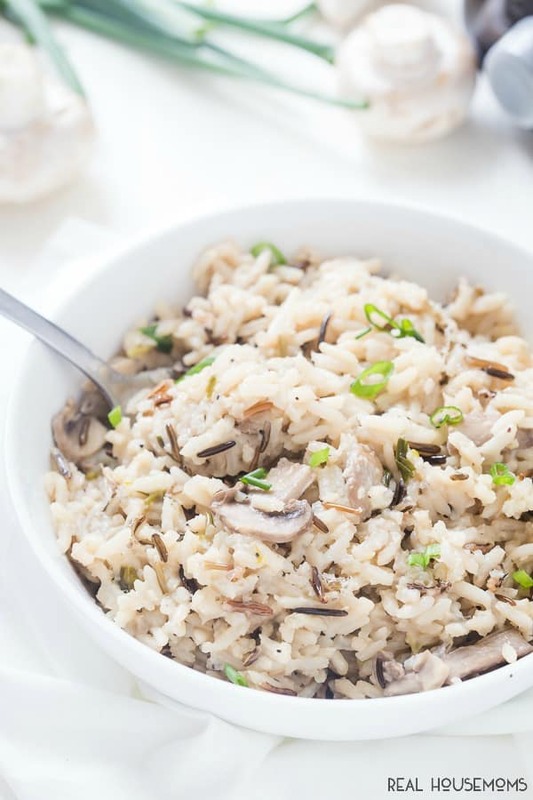 SLOW COOKER MUSHROOM & WILD RICE PILAF! Love it? Pin it to your CROCK POT board to SAVE it! It’s that time again where the weather starts to get cooler, and we start to think about the holidays. I still cannot get after the fact that it’s almost Halloween and before we know it Thanksgiving will be here. Where has the time gone? If you figure it out, please let me know. With that being said, I am already starting to think about Thanksgiving sides. Especially side dishes from my collection of best crock pot recipes! For Thanksgiving I am all about the sides – they are the best part! I can always skip the turkey but cannot skip the slow cooker loaded mashed potatoes with extra gravy, the best green bean casserole, the ROLLS, and the stuffing (it has to be stuffed in the turkey for me to devour it!). And lastly, we cannot forget about the time we all get to spend with our friends and family. One of the side dishes I grow up with is mushroom and wild rice pilaf. It cannot get any rice; it HAS to be wild rice. Making mushroom & wild rice pilaf isn’t hard and doesn’t take any time so make, so why are we making it in the slow cooker. I knew you were wondering that! I love making side dishes in my slow cooker because it frees up a stovetop burner so I can work on something else that doesn’t cook well in a slow cooker. Yes, it takes longer in the slow cooker, but it requires less hands-on time. For the slow cooker I used a 2-quart, but feel free to use any size you have. I also recommend using vegetable stock or beef stock and remember to purchase the reduced sodium kind because that allows you to control how salty your dish is. Whenever I am making homemade stock, I never add salt because who knows what I will be using it for. 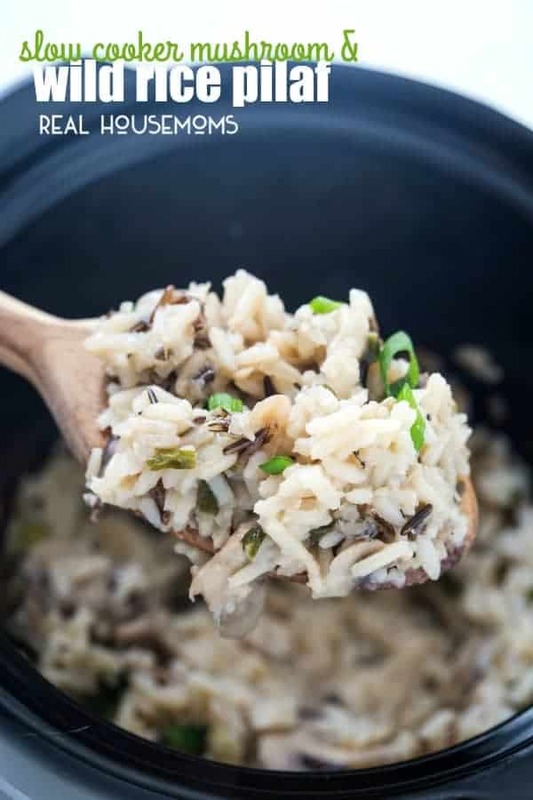 Slow Cooker Mushroom & Wild Rice Pilaf - I cannot get over how easy this rice pilaf is! It's perfect for potlucks or even for holiday gatherings. Always a must-have! Melt the butter in a medium pan over medium heat. Once the butter has melted, add the wild rice and toast until lightly browned. Place the mushrooms and green onions to the same pan and saute over medium heat for 2-3 minutes or until the mushrooms start to cook. Put the mixture and vegetable/beef stock into a 2-quart or larger slow cooker, cover, and cook on high for 3 hours. Stir and season with salt and pepper, to taste. The photo clearly has white or brown rice along with the wild rice… but not in recipe? It’s a wild rice blend. I think I may not understand the question, please let me know if I can better clarify.